Garmin Circular 7 Pin Cigarette Adapter Cable (010-10077-00) €27.00 - buy online at mysatnav.ie - Ireland's leading GPS & Sat Nav store. This cable will work with any GPS chartplotter with a circular 7 pin connector. 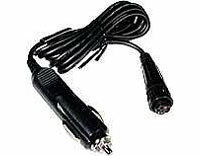 The cable can also be used to supply power with the PC interface cable (010-10150-00) when using your GPS with a PC. Connect the cable to one of the circular 7 pin ends on the PC interface cable.